Every city has its dividing line. Normally it’s south and north of a river or railway line that becomes the distinction between the eligibility of any given suburb. In Pretoria, it’s more a case of a line of division between east and west. East of Pretoria lie a collection of suburbs that include some of the city’s more upmarket communities like Waterkloof, Garsfontein, Faerie Glen and Lynnwood. 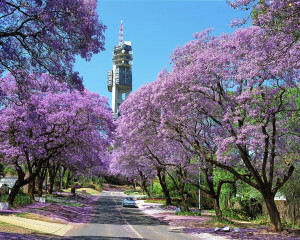 For holiday-makers, finding accommodation in Pretoria (PTA) in one of these suburbs is recommended as they are close to all the “Jacaranda City” has to offer. Most of the more elite suburbs lie in a curve that forms a semi-circle around the centre of Pretoria moving out, and, whilst some of these have been abandoned by Pretoria city-dwellers for the more recent security estates that have mushroomed in outlying suburbs, such as Silver Lakes, Garsfontein and Equestria, there is little that beats the beautiful, sedate old homes of Brooklyn, Hatfield and Waterkloof. For visitors it isn’t just the allure of elegant guest houses that grace this side of Pretoria. There are added attractions. Sammy Marks House, the Victorian-style home set in gorgeous gardens that forms an essential part of any trip east of the city not only provides an afternoon’s worth of ambling through Sammy Marks’ home as it was during the late 19th century, but a fine spread for afternoon tea on the verandah or in the garden. The National Botanical Gardens, the largest in Gauteng, offers an amazing array of over 20 000 indigenous, flowering plants, wild roses, tulips and gorgeous shade trees ideal for all-day picnics.